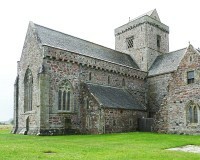 The island of Iona, where the Irish missionary Columba settled in the 6th century, is widely regarded as the cradle of Scottish Christianity. A Benedictine abbey was built in the 13th to 15th centuries, later becoming a cathedral. It fell into ruin after the Reformation, but in the late 19th century its hereditary owner, George Douglas Campbell, 8th Duke of Argyll, sought to restore it. John Honeyman made proposals in 1891 which were not implemented. In 1899 the Duke established a trust to carry out the restoration, and between 1901 and 1904 the transepts, crossing and choir were re-roofed. Authorship: It is clear from the minutes of the Iona Cathedral Trust that John Honeyman was personally responsible for the work carried out in 1903–4. He had retired from the practice of Honeyman, Keppie & Mackintosh by this date, but from August 1905, due to his failing eyesight, he was dependent on his old staff to make working drawings for Iona under the direction of John Keppie. There is no evidence that Mackintosh had any specific involvement in this work. Alternative names: Iona Abbey, St Mary's Cathedral, St Mary's Abbey. 1: Edinburgh, Royal Commission on the Ancient and Historical Monuments of Scotland: Iona Cathedral Trustees Archives, accession 2007/266, Trustees' Minute Book 1899–1922, p. 98.